LINCOLN WALKS AT MIDNIGHT- WEST VIRGINIA STATE CAPITOL-CHARLESTON, W.V. The statue Lincoln Walks At Midnight- stands in front of the West Virginia State Capitol building in Charleston, West Virginia facing the Kanawha River. “Abraham Lincoln Walks At Midnight” was a poem written in 1914 by Vachel Lindsay. In 1933 the sculptor Fred Martin Torrey statue Abraham Lincoln Walks At Midnight- was displaced at the World’s Fair in Chicago. In 1974 a nine and a half foot bronze casting of Torrey’s statue was executed by Bernard Wiepper a Charleston artist. 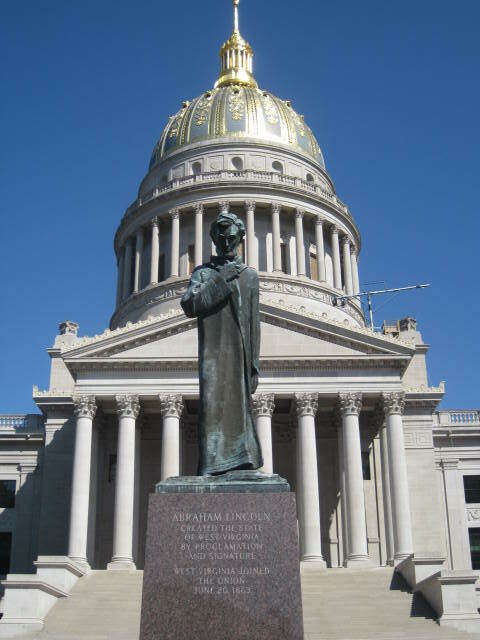 Abraham Lincoln is a key figure in the history of West Virginia. It was his decision to sign the document that made West Virginia the 33rd state during the American Civil War. Lincoln signed West Virginia into statehood on December 31, 1862- and West Virginia officially became a state on June 20, 1863. What is now West Virginia had been a part of Virginia up until then. I wonder how Lincoln would feel about West Virginia as a staunch Trump state today? If Lincoln were alive today he’d be rolling over in his grave- with the knowledge that the choice in a presidential campaign – Donald Trump vs Hillary Rodham Lincoln. … as far as WV goes- the democrats wrote that state off due to their anti-coal stance starting back in 2000. WV is no longer a yellow dog democratic state.